The two Gallagher brothers who used to be the nucleus of Oasis have released a new album each within two months of each other. Comparing the two is of course inviting. For both it is the third album since the split. For Liam it is the first solo album after two albums with the remains of Oasis under the name Beady Eye. Also the second album in a row where in the promo talks he threatens to retire. Yeah, sure. If anything As You Were is an album as close to Oasis as possible. Liam keeps up the legacy much more than Noel and not just because he's the voice. That sneering way of singing is recognisable from thousands of course. The love for the 60s is everywhere on the album, with several The Beatles references. To get to his goal, a successful album, Liam Gallagher brought in helpers for the writing and producing and that brings a clear focus. Far more than I ever heard with Beady Eye. Both records were alright at best. As You Were is a very traditional record. A collection of songs that could have been on any Oasis album following the first two. Most songs would have been an addition to those albums. From the time when the ruckus rock had left the band and prepossession with drugs had taken over, mellowing the sound out and cutting out the sharpness 'Definitely Maybe' and '(What's The Story) Morning Glory' held in them. It is in this vein that As You Were can be welcomed. What here in NL people, including myself, tend to overlook, is how huge this man and his former band were in the U.K. This album, entering the charts as #1, outsold the other 9 songs in the top ten and the single of the album was the best selling single in the past 20 years. Gallagher himself was voted best frontman ever in Q Magazine's readers' poll in 2010. All that passed us by somehow. The release must have been a huge thing over there. Here a new Laim (or Noel) Gallagher album is just another album by a fairly famous name. Nothing less but certainly nothing more. Although most songs individually are certainly o.k., as a whole I find that too many songs remain in the mid-tempo range and a sort of tediousness seeps through. 'I Get By' comes as a gift that saves the album. Written by Liam himself, it is one of the better songs on the album, proving that he has become an accomplished writer. The arrangement of the song is fine. Guitars weave in and out of each other in finely laid layers. References to famous titles are rife on As You Were. I leave them for you to discover them for yourself. They show what songs Liam likes to listen to. He has taste. Take it from another lover of 60s music. The references to that era seep through the music as well. In 'Chinatown', that starts off as a small song with just an acoustic guitar and atmosphere, psychedelia is let out of its cage and everything from The Small Faces to The Beatles is allowed in and is returned to where it belongs. With 'Come Back To Me' the album gets another boost. With a nice descending chords progression it maintains a tough beat and a rough guitar or two. 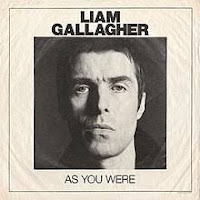 There are several people who worked with Gallagher on As You Were. One leaps out. As a great fan of Jeff Buckley, who rose to fame about the same time as Oasis, the name Michael Tighe catches my eye. He wrote two songs for Liam with Andrew Wyatt, 'Paper Crown and 'Chinatown' and co-wrote the first single 'Wall Of Glass' with a whole bunch of others. As a whole I keep some mixed feelings on the album. 44 Minutes seems a bit too much. I haven't heard a single bad song. It's just that I miss that little extra. That kick in the stomach. The kick, so I'm reading, that Noel provides in abundance if not overkill. What if the best songs of both albums had been recorded together? Yeah, what if?